In 1906 traffic on Austin’s busy Congress Avenue amounted to a mix of horse-drawn wagons or buggies, single riders on horseback, electric-powered street cars rolling along iron tracks, the occasional horseless carriage and pedestrians who had to keep a sharp eye if they didn’t want to get run over. When it rained, the broad thoroughfare leading from the Colorado River to the red granite capitol turned into one big mud puddle. When it didn’t rain, all the traffic kicked up a lot of dust. Finally, city fathers decided it was high time that the capital of Texas have at least one paved street and hired a contractor to lay bricks for Congress Avenue’s 1.2 mile extent. One of those present at the ceremonial setting of the first brick was Adolph Wilke, my great-grandfather. His nine-year-old son, my grandfather, later recalled that his dad had taken the street car from their home near 30th and Guadalupe to downtown for the momentous event that signified Austin’s transition from hick town to city. The bricks used to pave Congress came by train from Thurber, then a bustling industrial city of 10,000 halfway between Fort Worth and Abilene. A company town if there ever was one, Thurber had its beginning in 1888 when the Texas and Pacific Co. began mining coal there. In 1897, looking for a way to take advantage of leftover non-commercial pea coal as well as the rich deposits of shale clay in the area, the company diversified and began manufacturing brick in addition to mining. Before long, the Thurber brick plant was the largest and busiest west of the Mississippi. 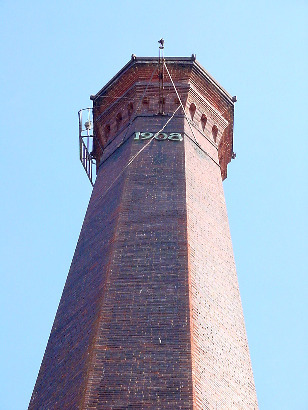 At its height of operation, the plant produced 40 varieties, from common brick (used in building construction) to numerous styles of the heavier pavers. Eight hundred workers produced 80,000 bricks a day. Thurber-made vitrified bricks spread all over Texas and the Southwest. Streets in Amarillo, Austin, Breckenridge, Fort Worth, Galveston and many more places were paved with them – in all, hundreds of miles of roadway and even an experimental highway in the Belton-Temple area consisting of two rows of bricks just wide enough for automobile tires. 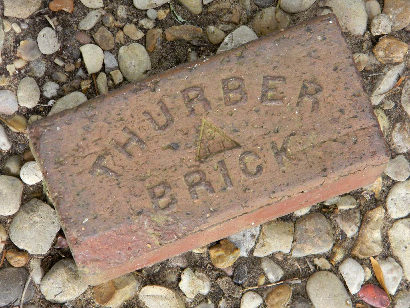 Thurber bricks also covered parts of U.S. 80. Common brick built many structures, including the Armor and Swift beef plants in Fort Worth’s stockyard district. The five-acre brick plant was a half-mile southwest of the town’s business section. The deposits of shale used to produce the bricks lay a mile north. Once workers dug the shale, they loaded it into electric rail cars that hauled it to the plant for grinding and mixture with water. The wet clay was extruded into molds and then baked in one of 17 kilns. Though initially fired by the small-sized coal, the kilns were later converted to burn natural gas. If you had to pick between being a coal miner or “brick rustler,” you would have wanted to be the latter. The miners descended 500 feet or so down a shaft early every morning, and except for a 30-mintute lunch break, they spent most of their 12-hour shift lying on their side in a coal vein never more than three feet high, wielding a pick and breathing the black dust. Both classes of employees, however, tended to congregate at the company-operated saloons in town, particularly The Snake. After working half-day shifts in less than ideal conditions, consuming ample quantities of cold beer made life seem a bit more worthwhile. There’s a story about several Thurber brick rustlers sitting in the saloon and listening to someone complain that he had a whole field of ripe corn he couldn’t get to because it literally crawled with rattlesnakes. Two of the brick workers allowed as how they could get the job down. After a handshake with the farmer, the two went to the company store and bought enough stove pipe to cut two sets of homemade snake guards for their legs. Then they proceeded to harvest the corn, presumably while the rattlers got sore mouths striking at their tin-clad legs. The ample supply of cheap oil that Texas and Pacific officials had played a role in discovering in 1917 around Ranger ended up slowly killing Thurber. Once the railroads began converting to oil-burning locomotives, the demand for coal atrophied. The brick business held firm a bit longer, but again, petroleum-based asphalt paving proved cheaper and less labor intensive than laying bricks.